"If it can go wrong, it will go wrong" Just when the Pens thought they were on the verge of having a full healthy roster they get set back further than they were all year in a matter of days. I don't know what it is with this team and injuries about this time of the year (if you recall last year was basically the same.) Here are some highlights from today's disastrous practice. Jordan Staal- Just when he was reaching the point where he was merely days away from his first start of the season, he gets set back twice as long as his original injury. He will have surgery tomorrow to repair his fractured right hand after being hit with a puck midway through practice. Likely looking at a return in late December at the best. Evgeni Malkin- He did not even lace up at practice today after being scratched for Saturday's game against Carolina. We still don't officially know what's wrong with Geno, but in Saturday's warmups he appeared to be limping a bit. He is listed as day-to-day. 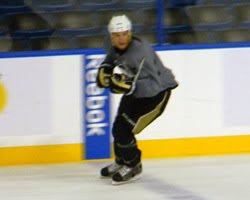 Kris Letang- Also did not practice. He exited Saturday's game after agitating a hand injury he received last Wednesday against Tampa and did not return for the rest of the game. He is day-to-day. Alex Goligoski- Ok, so this one came out of nowhere. Nobody has any clue what happened, just that he only practiced for a few minutes and is also listed as day-to-day. Zbynek Michalek- The only situation that didn't get worse today. He seems to be set for a return sometime this week. Look at the above list of guys. These are not depth players or fill-ins, but rather key members of the team. Despite this, I believe the Pens will find a way to cope. They have several very adequate replacements down in WBS that they could call up for the road trip. I have a hard time thinking that (especially with Letang AND Goligoski questionable) the Pens won't call up at least one defenseman. (likely Hutchinson) I guess all we can do now is hope for the best.